so on .Smart life start from a Rii Voice search Romote . Power button : Only this button with IR learning Technology . There is a Microphone button to control the function. Release it ,when you want to close the Microphone function. Waving your hand ,the cursor will move with your hand. There are 3leves speeds: Slow,Medium , Fast. The default speed is Medium. Hold on OK button and press VOL+ / VOL- to increase or decrease cursor speed. Mutifunction Wireless Mini backlit keyboard and fly mouse, 6-Axis Somatosensory and Infrared remote control,please note that the only the power key is able to be learned. 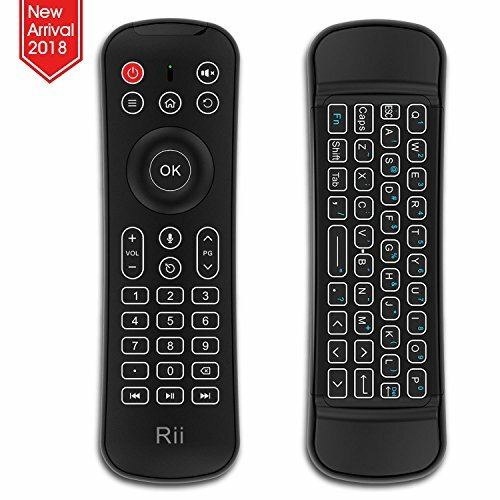 Compatible with KODI, Google Android Smart TV/Box,HTPC,IPTV,Networked set-top Box,Mini PC,HTPC,IPTV,Windows,MAC OS,PS3, Xbox 360,Projector etc,please note that it just support the Amazon Fire TV's original remote control functions(except the voice search),not work with amazon fire tv stick ! Backlit Press any key , the key will light for 5s ,then off until next press opeartion.